Thirteen-year-old Samuel and his mom have become frequent SkyWest passengers as they’ve traveled to receive treatment for Samuel’s medical complications. 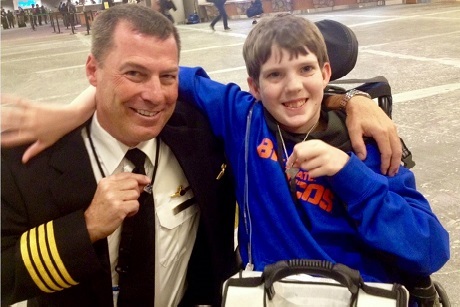 Last summer, while waiting to board a SkyWest aircraft, Samuel got the chance to speak to the pilot, Seattle ERJ Captain Jeff Ross. The brief interaction gave Samuel a new friend and a new outlook on life. Last summer, …[Sam] got the chance to speak to the pilot a bit… We were surprised to see the same man the next day for our return flight and happy to find out that he not only remembered Sam, but that he would once again be our captain. The two took a photo together and Captain Ross gave Sam an email address, asking if he could forward the photo along. Before long, they were exchanging letters and postcards. Jeff sent an old receiver of his to Sam because they fly over us heading into and out of BOI and it would allow Sam to listen and learn. He’s also sent books Sam’s way, encouraged him to keep on reading and to work hard in school and reminded him of how strong and brave he is when Sam has had to face more scary or painful procedures. Eight months later, Sam is happier than ever, no longer saying things like he wishes he’d never been born (something that had been becoming more frequently heard because he’d grown so very weary from being different and dealing with pain). I just wanted to thank you for hiring people like Jeff who go above and beyond on a daily basis. We have thoroughly enjoyed almost all of our flights and its because of the people you choose to hire. As of today, Sam and Captain Jeff are good friends who spend time planning the ultimate trip they could take together if money wasn’t an issue. So far, it includes flying upside down, jumping out of a plane, visiting Legoland and Disney World and spending lots of time in a flight simulator. Sam understands this trip isn’t possible, but just dreaming about it has put a smile on his face. Captain Jeff has changed Sam’s life, filled it with joy and helped him to deal with the things that make him different while also embracing and celebrating them at the same time because its all part of what makes Sam an incredible person. Thank you, Captain Ross, for your compassion, kindness and leadesrhip. His is one of many amazing examples of SkyWest people making a positive difference. Read more incredible stories like this. Interested in joining the phenomenal SkyWest team? Learn more about positions at SkyWest Airlines at www.skywest.com/careers.